A complete replacement of oil-based mud with other mud types provides the largest reduction in discharges of oil-contaminated cuttings to the sea compared to any other solutions. In the beginning of the 1980s, the oil companies in the North Sea began using oil-based drilling fluids to obtain faster and safer drilling operations. In 1982, the Danish National Agency for Environmental Protection (NAEP) granted the first permit to discharge oil contaminated cuttings in the Danish shelf area. During the subsequent years, considerable amounts of oil have been discharged into the North Sea from this source; Denmark’s contribution was, however, comparatively small. An assessment of the amounts of oil discharged into the North Sea in 1986 estimated the offshore oil industry’s contribution to 29,000 tones from a total amount of 71,000 – 150,000 tones. In 1988, the offshore oil industry’s contribution· constituted 22,600 tones; of this the Danish offshore industry contributed less than 700 tones (3%). In 1989, the Danish contribution was 455 tones and in 1990 it was 474 tones. Many surveys have been made in Denmark and elsewhere to assess the environmental consequences of these discharges, both on a short and a long-term basis. The results of these surveys have not always been easy to interpret, but it is now generally accepted that discharges of oil-based mud affect the environment near the point of discharge; the extent of the influence depends on the oil type, the amounts discharged, water current, etc. A slow reestablishment of the natural marine environment will probably take place. Generally, the discharged oil is only degraded in the oxidized top centimeters of the sediment, and the oil may remain in the deeper layers, until redistribution of the seabed brings it to the oxidized surface layer, where the degradation processes may continue. Out of concern for the environmental effects, that i.a. the discharge of oil-based mud could have on the North Sea, the Ministers for the Environment decided at the Third North Sea Conference in March 1990 to reduce discharges of oil-based mud from offshore installations. The Ministers undertook to prepare national action plans with a view to ban discharges of oil contaminated cuttings and, at the same time, to formulate a definition thereof. The plans were to be submitted to the Paris Commission in 1991. Normally, discharge of oil-contaminated cuttings may only take place from production wells (not exploration wells) in the central part of the North Sea and only if there are drilling technical and/or safety reasons for this, and usually only when drilling the deeper well sections. In its discharge permits, the NAEP requires that the oil-based mud used is low toxic, with full documentation of contents and with a documented low taint effect on flatfish. The NAEP also requires that the oil content of the discharged material does not exceed the limit value of100 g/kg dry material in each section which is drilled by the use of oil-based drilling mud. The oil-based drilling mud has proved its superiority as regards technical as well as safety aspects in the past years. It is thus generally accepted that certain wells could not have been drilled at the time, without the use of oil-based drilling mud. Furthermore, there have been special formation and geometrical conditions concerning the development of horizontal wells which have made the use of oil-based drilling mud necessary. It has, i.a., been necessary to minimize the friction between the drill string and the borehole wall to obtain the required length of horizontal sections. Furthermore, the shale formation above the oil producing formations had to be protected in the best possible way against swelling and disintegration, as the drilling time is prolonged in this formation when drilling horizontal wells. In connection with the use of oil-based drilling mud, the cuttings have typically been subjected to a cleaning process – in addition to the usual separation by means of shale shaker, mud cleaner, and mud centrifuge – before discharge into the sea. The cleaning has been performed to keep the oil content on or under 100 g/kg discharged dry material which is the Danish authorities’ limit value. Two different cleaning systems have been used. One of these systems uses the “dilution” principle, where the amount of oil on the cuttings is diluted by a fluid mixture (oil/water in the ratio of 70/30), after which a separation of cuttings and oil–based mud is carried out by means of centrifugation. The other system uses the “cleaning” principle, where the cuttings are cleaned in a drum with aqueous detergent. The separation takes place on a screen where the coarse cuttings are sifted out and discharged into the sea. The cleaning fluid and the fine cuttings are separated by means of centrifugation. Irrespective of which system has been used, it has been difficult in certain situations to observe the established limit for the oil retention, partly due to variation in the technical efficiency of the cleaning equipment caused by the operating conditions, partly due to special formation characteristics. In order to fulfill the NAEPs requirement with resections, to reporting, various procedures have been used to monitor the discharge of oil contaminated drill cuttings. The main tools have been retort analyses and mass balances of increasing elaborateness. Initially, the method to determine the oil retention was based on the amount of drilling mud received and made on site while drilling, less the amount back loaded at the end of the well and the amount left behind casings. The oil retention figures derived this way had a high degree of uncertainty, which led to reporting of oil retention figures, which were probably higher than the actual value. In order to reduce this uncertainty, the mass balance was gradually extended to cover all the streams in the mud processing system and the final version was established mid 1988. This mass balance required sampling and retort analyses of the mud at several discharge points in the mud processing system as well as measurements of discharge volumes from the different pieces of mud processing equipment. Although the mass balance is mathematically correct and allows various cross checks to be performed, some input still has to be estimated. This is the case for the actual hole size and thereby the amount of cuttings from the 121/ 4″ section, which must be determined from lag time tests only. Open hole caliper logs cannot normally be obtained due to the time dependent sensitive nature of the shale formation in this section. Further, the volume of losses at surface and down hole are difficult to determine with accuracy, e.g. seepage losses may be masked in the daily monitoring, but could result in a large uncertainty in the final calculations. Other factors that affect the calculation and which cannot be determined accurately are evaporation of mud and build-up of fine particles in the mud. 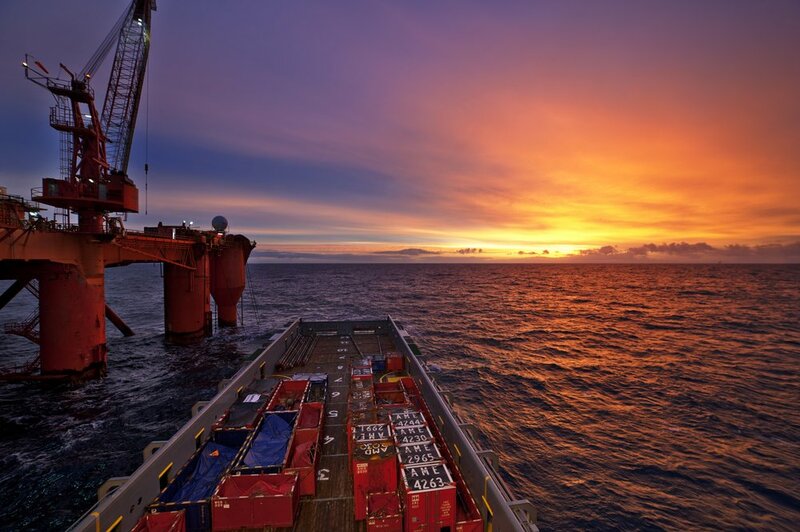 The goal of the procedure was very ambitious but the work involved was found to be extremely time consuming for the supervisory personnel, both offshore and ‘at the base. In the period 1987 – 1989, the cuttings cleaning performance was unacceptable and gave rise to several audits on the drilling rigs with the objective to reduce the operational spills of oil-based mud and to increase the efficiency of the cuttings washing equipment. As a result of these efforts the average oil retention was improved. However, in view of the difficulties in achieving this result, it became clear, that further reduction in the oil retention would probably not be possible with the existing equipment. In parallel with an investigation into alternative cuttings washing equipment, field trials were initiated using water-based drilling fluid on several projects. The trials were initially performed on deviated wells, i.e. Kraka A-5 in 1989 and Dagmar-4, Dagmar-5, Gorm N-31, N-32, N-33 and Skjold-8 in 1990. In 1990 the trials were extended to include the horizontal wells Valdemar-2H and Dan MFA-15. Field locations are shown in Figure 1. Following the Third North Sea Conference in May, 1990, when the ministers for the Environment decided to reduce discharges from offshore installations, a Danish work group was formed in September, 1990, with representatives from the Ministry of Energy, the Ministry of the Environment, the Ministry of Fisheries, the Danish Energy Agency (DEA), the National Agency for Environmental Protection (NAEP), the Laboratory for the Ministry of Fisheries and the North Sea Operators’ Committee, Denmark (NSOC-D) . The objective of the work group was to prepare the National Action Plan for Denmark with respect to elimination of discharges of oilcontaminated drill cuttings. As the work progressed in the work group, the findings of Maersk Oil and Gas AS, concerning alternative means of reducing discharges of oil contaminated cuttings, were confirmed. With regard to improvement of present cleaning methods, there had not been any great progress and it was not expected, that results better than 60 – 70 grammes of oil per kilo discharged dry material could be achieved, even under the best possible conditions and by the use of a new water-repellent fluid in the cleaning process. Transport of cuttings to shore for disposal was investigated, but was found to be unattractive for safety and economical reasons. Among the other alternatives, the retort principle should be mentioned. With this method, cuttings are heated in a special boiler to evaporate the water in the drilling mud. The steam carries the oil along to a condenser, where the steam condenses and can be separated from the oil. In another “retort” system, the cuttings are heated to the extent, which also the oil evaporates and has to be condensed later. Plants which function according to these principles have been tested onshore and have been shown to be able to reduce the oil retention on drill cuttings to as little as 0.5%. Presently, however, the processing capacity of the systems is in the order of 2 – 3 tones of drill cuttings per hour. This must be compared to a need for up to 10 tons per hour at peak loads, although on a daily basis, the drilled amount will seldom exceed a total of 100 tones. This load, however, normally lasts 2 days and as the retort systems may treat 48 – 72 tons/day, it will thus be necessary to establish a buffer storage, which is capable of storing 56 -104 tones as a minimum. In practice, this buffer storage would have to be designed for the full amount of 200 tones, to cater for potential operations stop on the retort plant. Finally, there are companies undertaking to develop methods using solvents or bacteriological degradation of the oil. These methods are said to give oil retentions of less than 1%, but with a limited capacity. It is therefore clear, that at present, there is not any equipment on the market which, for the Danish area, under all circumstances will be able to clean the cuttings to a lower value than 100 g oil per kg discharged dry material in a feasible way. However, pilot installations of such systems (retort principle) are being tested onshore and may be developed for use on large drilling rigs within a few years. Development of similar equipment for use on smaller rigs with space and/or weight restrictions is considered more difficult. Based on all of the above considerations, but primarily on the successful field trials of water-based muds, and in anticipation of a reduced limit value for oil retention on cuttings in the near future, rsk Olie og Gas AS decided in December, 1990, to discontinue the use of oil-based mud, such that oil-based mud will only be used – with discharge of oilcontaminated cuttings as a consequence – in exceptional cases, where the use is required for technical/ safety reasons. The exceptional cases may typically be drilling operations where problems with the use of water-based mud (or more recent types of mud) must be solved by means of oil-based mud, or wells which are only considered to be viable if oil-based mud is used from the outset. By taking this decision, mrsk Olie og Gas AS has contributed to a reduction of approximately 90% of the total Danish discharge of hydrocarbons to the North Sea. Since the initiation of the field trials and up to the present, 15 wells have been drilled with water-based, non-dispersed, polymer mud. Two types, I and II, have been used. Both types use potassium chloride as the primary shale swelling inhibitor and a polymer, PHPA (Partly Hydrolyzed Poly-anionic Acryl amide), to encapsulate the cuttings and coat the borehole wall. Viscosity and fluid loss control is achieved with Poly-Anionic Cellulose (PAC) and modified starch products. Mud type I is the standard mud. Mud type II incorporates in addition some 15% polyglycerine, which increases the inhibitive characteristics of the mud by competing with· water for adsorption sites on clay minerals. Further, the polyglycerine reduces water activity, thereby minimizing the potential of water to hydrate clays, and finally, it increases the lubricity of the mud. However, due to higher cost, refer to table 1, mud type II has been used on four wells only. The standard KCl/PHPA mud is used in the troublesome shale section (12-1/4″ (311 rom) hole) maintaining the concentrations..of KCl and PHPA at 25 ppb (71 kg/m3) and 0.5 – 1.0 ppb (1. 4 – 2.8 kg/m3) respectively. The mud is re-used while drilling the reservoir section (8-1/2″ (216 mm) hole), allowing the concentrations of KCl and PHPA to drop off and maintain viscosity and fluid loss control by additions of high grade PACs and Dextrid. The mud system incorporating polyglycerine is used in the 121/ 4″ (311 mm) section only and is replaced by a simple PAC/Dextrid system equivalent to the standard mud in the 8-1/2″ (216mm) section. Both mud types have been found to be more susceptible to solids contamination than oil-based mud, although the effect is less marked in mud type I I . In those cases where the solids control equipment has not been operated optimally, it has been required to dilute the systems with whole mud. In this context, the experience has been that it is a time consuming task to mix PHPA, in its dry powder form, and unless good mixing facilities exist, it may be worthwhile to use the liquid form where PHPA is suspended in a carrier fluid. Barite sagging has been experienced on a few wells, giving rise to well control problems which in turn required additional circulation to condition the mud. Extensive laboratory analyses of the mud have not been able to explain the phenomenon explicitly, although there are indications that the problem may have been aggravated by the presence of SAPP (Sodium Acid Pyro Phosphate) in the barite. SAPP is used to scavenge calcium in the manufacturing process of barite, but the chemical also acts as a thinner in water-based drilling fluids and is as such not acceptable. Mud cost key figures for the different mud types have been listed in table 1. The unit cost in DKK/bbl for the various mud types can be compared directly. As a rule of thumb, the make-up cost for the water-based mud, type I, is half of that of mud type II, which in turn is half the price of oil-based mud. However, both the oil-based mud and the water-based mud, type II, can be cleaned and reused on subsequent wells, thereby lowering the cost per foot. A direct comparison of the cost per foot figures must be done with caution, since this cost indicator is highly affected by the amount of mud lost while drilling and other drilling problems. The wells, Skjold-9 and 10, are examples of this, with mud costs per foot up to three times that of an average well. The comparison indicates that oil-based mud and water-based mud, type I, are comparable in the 8-1/2″ (216 mm) hole section. The water-based, type II, appears to be the least cost effective, but, since this mud type has been used mostly on problem wells, the comparison is not valid. Comparison of various drilling performance indicators have been made between wells drilled with oil-based mud and wells drilled with water-based mud. Based on caliper logs over the horizontal reservoir section of Kraka-A4H (oil-based mud) and Kraka-AsH (water-based mud), the comparison revealed a near gauge hole in A4H, whereas the log of ASH indicated a larger gauge and washouts/ ledges over the entire section. While running the 7″ production liner in ASH, the liner hung up on the ledges and could not be run fully to total depth. This problem, however, has not been apparent on other horizontal wells in Tyra, Dan or Valdemar, where the holes have been in gauge and smooth. The problem experienced in Kraka-AsH has therefore not been attributed to the use of waterbased mud. In wells with comparable trajectories, primarily horizontal wells, the rate of penetration has been higher when drilling with water-based mud, in some cases up to twice the ROP in a similar well drilled with oil-based mud, e.g. MD-7 and MD-8. Refer to table 2. However, the rate of penetration is influenced by many factors, of which the mud type is not the most important. Therefore a true comparison is difficult. Torque and drag have been monitored in the horizontal hole section in a number of wells. Table 3 lists these parameters obtained near total depth of the wells in question. The torque figures reflect a situation with the bit just off bottom and the drag figures have been calculated as string weight up minus string weight down, divided by two. Although oil-based mud is supposed to have a higher lubricity than water-based mud there does not seem to be an increase in the torque and drag figures in the wells drilled with water-based mud. On the contrary, the maximum torque appears to be in the order of 9000 ft*lbs (12195 J), drilling with water-based mud, compared to up to 12,000 ft*lbs (16260 J) when oil based mud has been used. Likewise, lower figures for drag, i. e. 10,000 – 15,000 lbs (44,480 – 66,720 N), have been obtained in two of the wells drilled with water-based mud. The exception, Dan well MFA-18, which exhibited a maximum torque of 16,000 ft*lbs (21680 J) and a drag of 50,000 lbs (222,400 N), falls outside the comparison since the horizontal section in this well is approx. 6200 ft (2034 m), i.e. twice as long as any of the comparison wells drilled with oil based mud. Table 3 Comparison of Torgue and Drag in Bori.ontal Well. Investigation into improvement of existing cuttings cleaning systems and alternative methods have revealed, that there is not equipment available, which can consistently clean the drill cuttings to achieve oil retentions considerably below 10%, which was likely to be a requirement in Denmark. Other methods such as transport of cuttings to shore for disposal have not been found attractive on safety and economical grounds. The field trials of replacing oil based mud with improved water-based mud types have been successful and prove, that even horizontal wells can be drilled without any significant changes in various drilling parameters, i.e. torque, drag and rate of penetration. Cost wise, the standard water-based mud compares favorably with oil based mud. This has to change drilling fluid, such that in future, oil-based mud will only be used in exceptional situations, where the use is required for technical/safety reasons.